Historically interesting American ship diorama showing a ship passing the Marblehead, Ohio Lighthouse. The Marblehead Light, located on the Marblehead peninsula on Lake Erie, is the oldest continuously operating light on the Great Lakes. It was constructed in 1821. In 1880 a nearby dwelling was built for its keeper, and the Light was heightened in 1897. 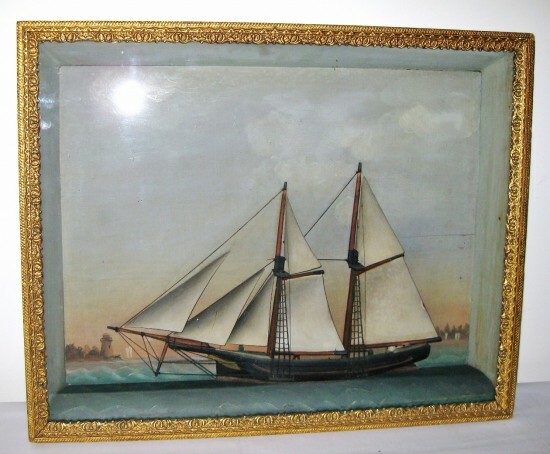 The ship has carved wood sails, and, overall nice composition and soft appealing colors. The diorama construction is all white pine. Excellent original condition including the gold frame. The size is 25 1/4″ wide, 20 1/2″ high and 3″ deep. Probably 4th Q 19th C. From an old Michigan collection.